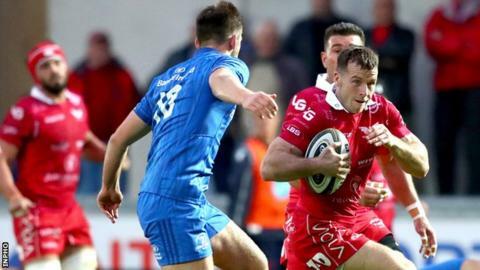 Scarlets maintained their impressive home record with a 23-21 victory over Pro14 champions Leinster. Scarlets captain Ken Owens opened the scoring but wings Fergus McFadden and James Lowe responded for Leinster. Leigh Halfpenny added two penalties for the hosts after the break before Hadleigh Parkes put scrum-half Gareth Davies through to score. Leinster hit back through Rhys Ruddock to set up a tense finish but Scarlets held on for a thrilling win. Halfpenny successfully converted all five of his place kicks while Leinster's Ross Byrne missed two vital penalty attempts as Scarlets extended their unbeaten Pro14 record at Parc y Scarlets, which stretches back to September 2016. The narrow victory proved bittersweet for Wayne Pivac's already injury-hit side after they lost wing Johnny McNicholl, number 8 Josh Macleod and prop Rob Evans in the first half, followed by lock Jake Ball after the break. Leinster went down to 14 men in the opening five minutes after conceding successive penalties close to their try line, with flanker Josh Murphy seeing yellow. Scarlets capitalised on the extra man with Parkes making a typical barnstorming run into Leinster's 22 before offloading to Davies. The Wales scrum-half looked to have scored but a try-saving tackle from fly-half Byrne forced a knock-on. Scarlets broke the deadlock on 10 minutes after a sustained spell camped inside Leinster's 22, with man of the match Owens touching down over the whitewash. Halfpenny, who along with Wales team-mates Samson Lee, Ball and Parkes made his first competitive start of the new Pro14 season, added the conversion. A powerful driving maul from Leinster proved the catalyst for their first try, with McFadden latching onto a skip pass to cross in the corner. Byrne was on target with the extras to tie the scores. Halfpenny edged Scarlets back in front with a penalty before Leinster enjoyed a spell of forward pressure in the latter stages of the half. Their driving maul crossed the whitewash but, after consulting the TMO, there was no evidence of a clear grounding. It was then Scarlets turn to be penalised for repeat infringements, with Lee earning 10 minutes in the sin bin. Despite brave defending by the home side, Leinster wing Lowe took advantage of the man overlap to touch down in the corner for the last play of the half and Byrne was successful with the touchline conversion. A Halfpenny penalty reduced the deficit to a point after the break when Leinster were penalised in the scrum, and ill discipline could have seen it cancelled out immediately after the restart but Byrne's effort was wide of the target. Halfpenny added another penalty just after the hour to regain the lead for the home side but it could have been five if they had been more clinical off the driving maul. Scarlets made no mistake on their next sight of the whitewash, with Parkes and Davies combining as they did in the first half, this time there was no question of the scrum-half's grounding. Halfpenny was again on target with his conversion. Typical of the European champions, Leinster hit back with a try through flanker Ruddock and Byrne narrowed the gap to two points with just minutes remaining. But Scarlets held on during a nail-biting finale to claim a measure of revenge against the side that knocked them out of the European Champions Cup and claimed victory in the Pro14 final last season. "We have had a bit of time to reflect on last season and we knew we needed to improve against Leinster so to have them in round two allowed us to see how much work we have done. "The result is first and foremost very pleasing. To control the last 10 minutes and the discipline not to give away a penalty was superb stuff. "And to do it with some casualties in the first half, everyone did their bit and I'm really pleased from a squad point of view. Scarlets: Halfpenny; McNicholl, Fonotia, Parkes, Prydie; D Jones, G Davies, R Evans, Owens (capt), Lee, Ball, Cummins, Thomson, J Davies, Macleod. Replacements; Elias, Price, Kruger, Rawlins, Kennedy, Hidalgo-Clyne, Asquith, Nicholas. Replacements: Tracy, Dooley, Porter, Kearney, Deegan, McGrath, Reid, Tomane.